by mail-in or online rebate when you use your Toro Credit Card. on Toro product purchases of $500 or more. Interest will be charged to your account from the purchase date if the purchase balance is not paid in full within 12 months. *Receive up to a $100 Visa prepaid card on qualifying purchases. For qualifying purchases of $500-$799 and financed on the 12 month special financing plan, you may receive a $50 Visa prepaid card, or for qualifying purchases of $800 or more and financed on the 12 month special financing plan, you may receive a $100 Visa prepaid card. Purchases must be made between 11/1/18 – 1/31/19. Complete purchase must be made on the Toro Credit Card. One Visa prepaid card per transaction. Subject to credit approval. Visa prepaid card is given to you as a rebate and no money has been paid by you for the card. Card is issued by MetaBank®, Member FDIC, pursuant to a license from Visa U.S.A. Inc. No cash access or recurring payments. Can be used everywhere Visa debit cards are accepted. Cards expire after 6 months; unused funds will be forfeited at midnight EST the last day of the month of the valid through date. Card terms and conditions apply, see MyPrepaidCenter.com/site/visa-promo. Purchase must be made in a single transaction. Toro Credit Card is issued by Citibank, N.A. 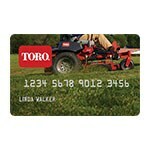 †With credit approval for qualifying purchases made on the Toro Credit Card at participating dealers. As of December 26, 2018, Purchase APR: Variable 25.99%. Minimum interest charge $2.00. See card agreement for details. Offer valid for accounts in good standing; is subject to change without notice; see dealer for details. May not be combined with any other credit promotion offer. Download and submit your rebate online at Rebate Redemption. How to Get Cash Back on Your Toro Lawnmower - View Our Toro Lawnmower Credit Card Rebate Offers. Our lawn mower how-to library can help you pick the perfect reel lawn mower, push lawn mower, riding lawn mower, zero turn lawn mower, lawn tool or lawn mower accessory.